1700-plus photos taken during our three-week trip mean lots of memories and lots of editing, along with some deleting. I hate to delete photos, always thinking that perhaps there will be some bit of information I might use, or some corner to crop. 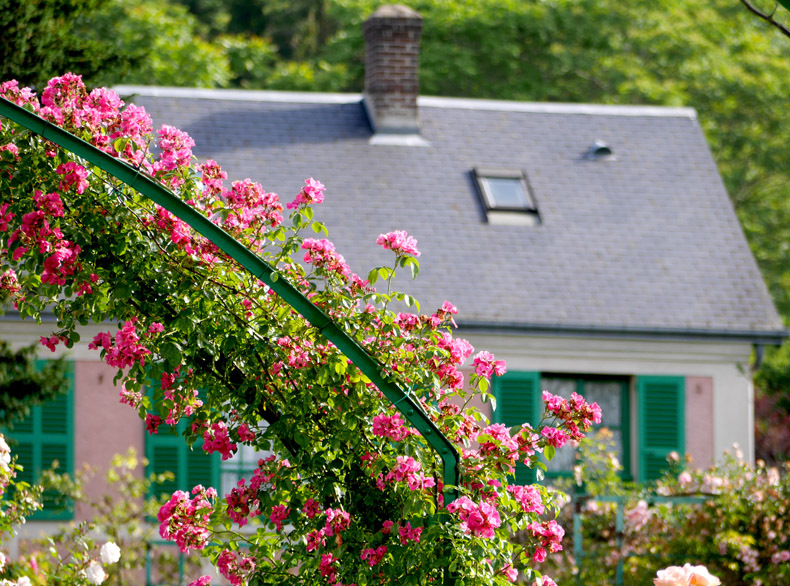 Let's revisit Monet's home in Giverny. I showed you bits of the garden in this post. We'll walk through the pathways and arrive at the rose-framed house where the door is standing open. It's early in the morning, before the crowds arrive. We wander through sitting rooms and up a narrow stairway. Most houses of this time favored dark rooms full of dark furniture and lots of wood. As one might expect from Monet, the painter of light, he disregarded the fashion of the day and chose the colours he loved. Light streams through large windows into his bedroom, above, and fills it with airiness. Monet's step-daughter, Blanche, also loved to paint. Her room is seen above. After Monet's death, his son Michel inherited the house and allowed Blanche to live in the house until her death in 1947. The gardens fell to ruin and restoration was begun in 1966, after Michel died. Here's a link to a site with photos of the house as it was. It's in French, but the photos speak for themselves. Several years ago I took a book out of the library - Monet's Table: The Cooking Journals of Claude Monet. He loved cooking (and eating) and planning menus. After reading the book I was inspired to keep a journal of meals I'd cooked and served for special occasions. 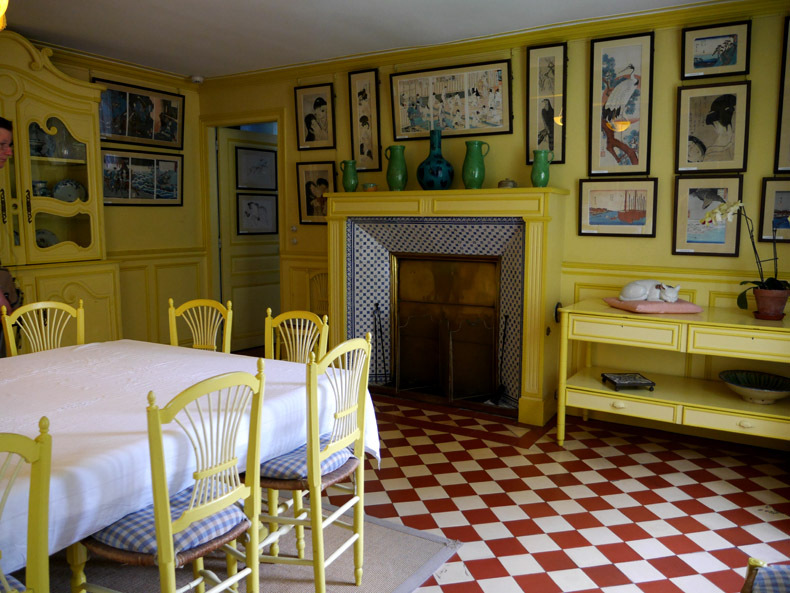 I was most curious to see the dining room with its bright yellow walls. I wondered if it would look as inviting in real life as it had in the book. The room exceeded my expectations. Those clear yellow walls, red-checked floor and blue accents work so beautifully together. It's daring and masterful. I can just imagine the laughter and clinking of cutlery against plates around the table. Such a pretty room. Monet had an amazing collection of woodblock prints which are displayed throughout the house. A few details from the house - a clock in the sitting room, a dining room chair, and a demure eyelet lace curtained window. Then, the kitchen. Oh my. 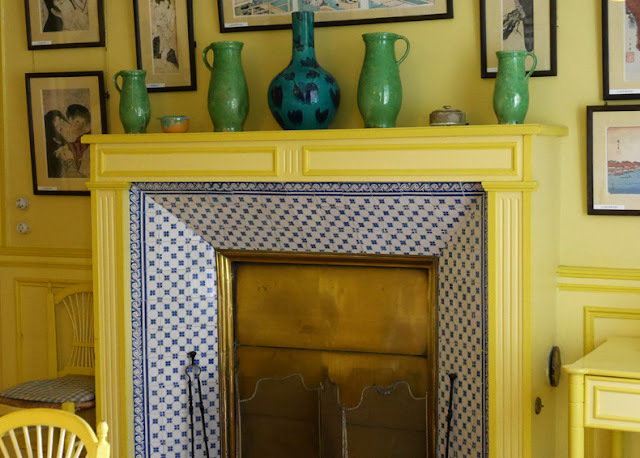 Beautiful blue and white tiles on the walls, made in nearby Rouen, add such life to this large room. 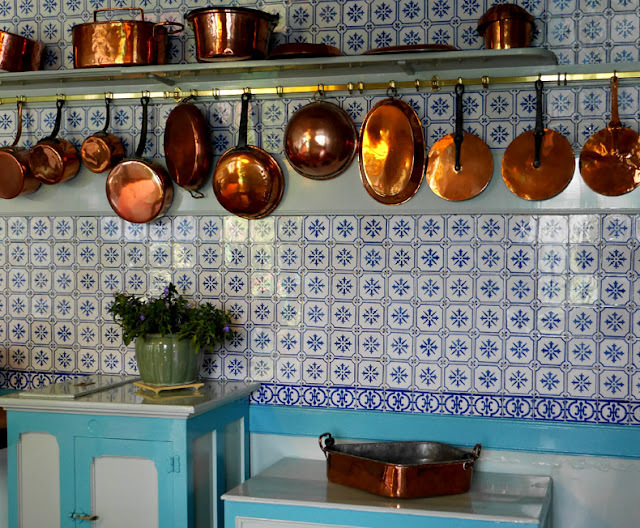 I think that any food would taste delicious and turn out exquisitely if prepared using those gorgeous copper pots and pans. One last rose from the garden to close this post. I'm linking to Mosaic Monday, hosted for the first time by Maggie of Normandy Life. Many thanks to Judith for her work in keeping the link up going for several years. There are so many interesting blogs that link there. What a great post Lorrie! I'm a fan of Monet's paintings, but never visited Giverny. Only read a book about it. That muted yellow in the decoration is wonderful. Have a great first August week! Hello Lorrie, thank you for this fabulous post! Monet's garden is of course wonderful... but the house is gorgeous as well. Lovely photos! Have a happy new week and month! We all knew about the gardens, but the house is a surprise! The yellow dining room spoke right to my heart - beautiful! 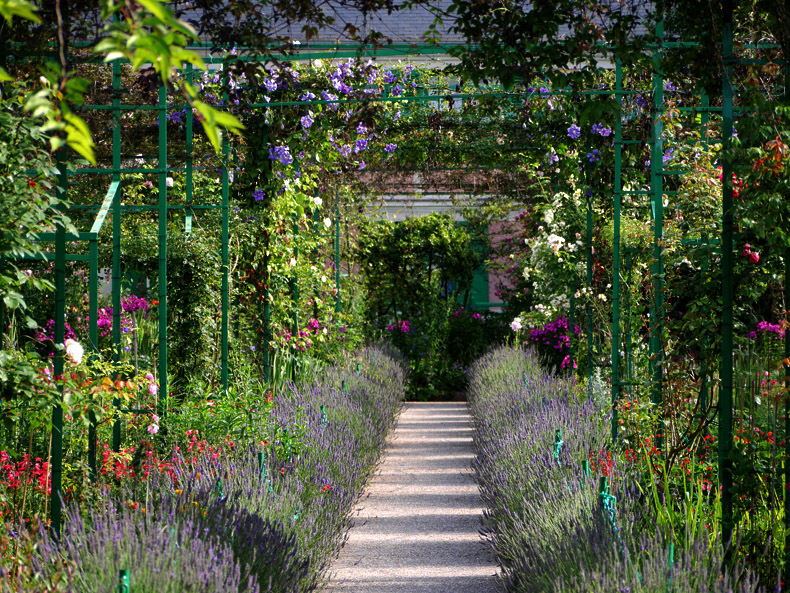 Such a lovely post about Monet's garden. Have always wanted to visit it and have some books about Monet and his garden. Thank you! It's years since we were there, but that was a wonderful revisit. It's been almost ten years since I visited Giverney so it was lovely to wander around the house again with you today and remind myself of the vivid yellow dining room, the tiles in the kitchen and the curious white & blue clock. Thanks for joining in with my first MM, all seems to be going well so far! You certainly took us on a beautiful tour, I loved the gardens but the house was a real delight particularly the kitchen, stunning. Hello, lovely gardens and a beautiful house. Thanks for sharing your lovely tour. Happy Monday, enjoy your new week ahead! Oh how PRETTY! I feel like I was right there with you & I learned several new things this Monday Morning. Thanks for sharing your trip. My goodness, what a house! The gardens are gorgeous too. The house is go grand. How fortunate you are to have visited and kind for taking the time to share with us. It was an amazing place to visit and being able to wander around the house I found to be so exciting last year just as you did Lorrie. The paintings everywhere were a feast for the eyes, and yes, the kitchen and dining areas were so colorful. I loved the entire village where there was a flea market set up in the early morning sunshine - I bought some jewelry and wanted much more - linens, antiques etc. but of course had to resist, just couldn't cart all that back to the boat and on to Provence and Spain, haha! I enjoyed this tour so much. Such a cheerful kitchen, I just love the colors (as I am about to paint my yellow kitchen a different color :-( --- and what a great idea to record company meals--I'm always trying to remember what I serve but never take the time to write it down. Lastly, the blue and white tiles, always reminds me of the story of Heidi as there were delft blue and white tiles behind their stove in the town house. Such a wonderful post today! The dinning chairs are so unexpected, delicate like Monet's flowers. I searched online for Claude Monet's dining chairs, furniture reproduction, and found nothing but photos of the dining room. There must be someplace that sells the reproduction. It is unusual to see such brightness of colours from that time period and the dining room in yellow is extraordinary. I was not aware the gardens were allowed to go to ruin and any wonderful photos I've seen must have been when they were at their peak. The colors of his home make me happy looking at them! I'm a fan of his! I just loved my visits to Monet's home and gardens. Yes, the yellow in the dining room is so very cheerful and loved the kitchen too. Thanks for sharing. Thank you for the lovely tour of Monet's house. I adore the bright yellow kitchen and blue and white tiles. Your new camera was certainly put to good use during your trip! Do you ever take like 10 identical pictures and then later agonize over which image is the "best"? 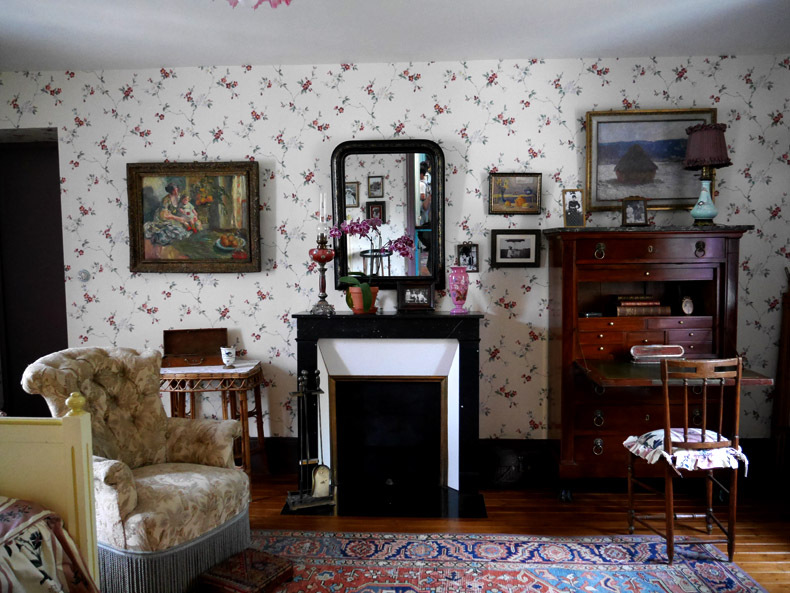 Your tour of Monet's home leaves me feeling as though I have just walked through the house. Thank you for bringing it all back to me as I remember it from my visit there. Like you I fell in love with the beautiful kitchen. I love the blue tiles and of course the gardens. Thanks for the tour……….. The garden is gorgeous! Love it! 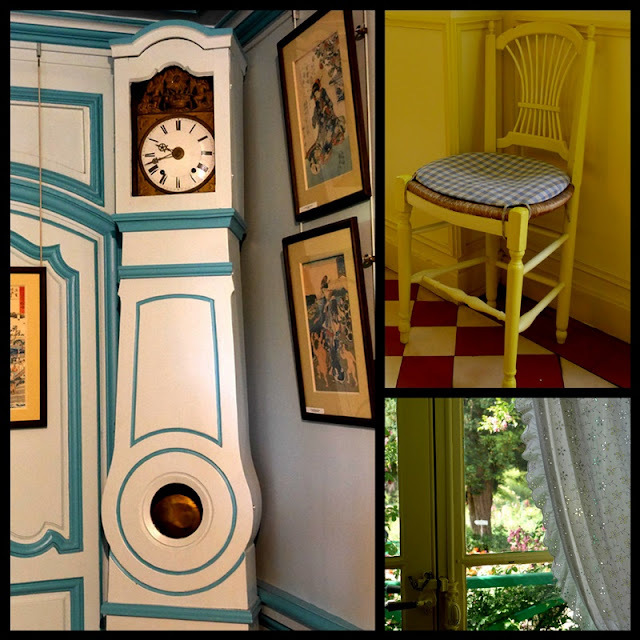 The dining room's yellow walls and furniture with the red and white floors made me think of Alice in Wonderland. Thank you for sharing with us! You've given us an amazing tour here! All that blue and white and shining copper, heavenly! Now I have to find Monet's Table to have a little taste of what you experienced. What an amazing place this must have been, Lorrie. And in my absences from blogging lately I've missed so many of these beautiful countries you've visited--but I've loved reading them tonight and seeing your beautiful photographs, and the fashions you saw on the streets of Paris was a fascinating account! You'll have many wonderful memories, won't you? Thank you for visiting my post Lorri and leaving a message. Good to meet you today and see the wonderful details you shared from Monet's Table. The copper cooking pots and pans were beyond wonderful. Monet (and his house) was such an inspired man, they have really done him justice in keeping his home so beautifully. 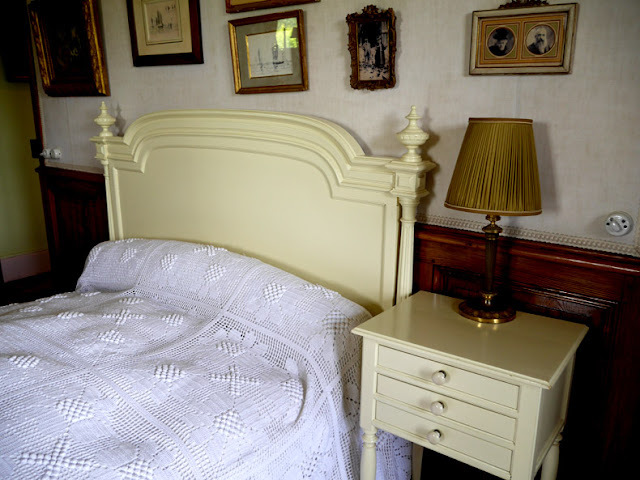 How wonderful it is to be touring Monet's home while still in my pj's. Sometimes I find touring old homes to be a bit boring because of all of the old, dark furniture. Monet's color choices kept my interest from start to finish. I especially like the kitchen and dining room. So pretty. What an absolutely amazing trip -- and a wonderful home tour. Those colors! The light! Really amazing to think what was "in style" back when heavy dark furniture and rooms were the rage. Oh my...where to begin...such beauty in every photo! How would you even begin to delete any of them? Stunning gardens and lovely architecture and decor! It so happens that I was thinking the very same thing yesterday...about the chore of going through all of my photos and deleting some. I feel the same way about deleting them but I really must! 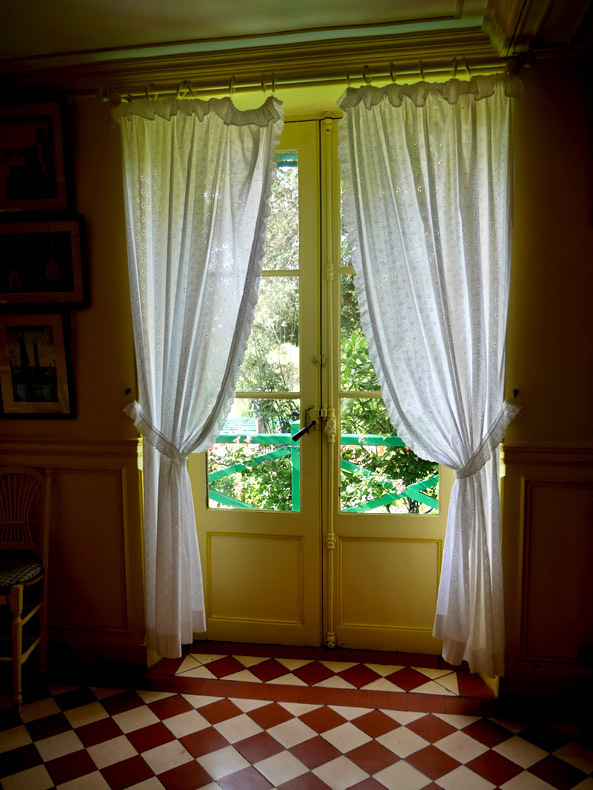 Those are such beautiful photos of Monet's house. I love the yellow and blue kitchen. I actually bought some post-cards of those rooms at the Vancouver Art Gallery decades ago and had them on my fridge. They are such bright, lively rooms. On a rainy West Coast day, they delight me. This is a wonderful post, Lorrie!! That garden is spectacular (I'll be reading your other post of the garden later this evening) and the house is artistic and homey at the same time. How I love that blue and yellow dining room; it reminds me of our kitchen colors, except Monet's room is a brighter yellow. 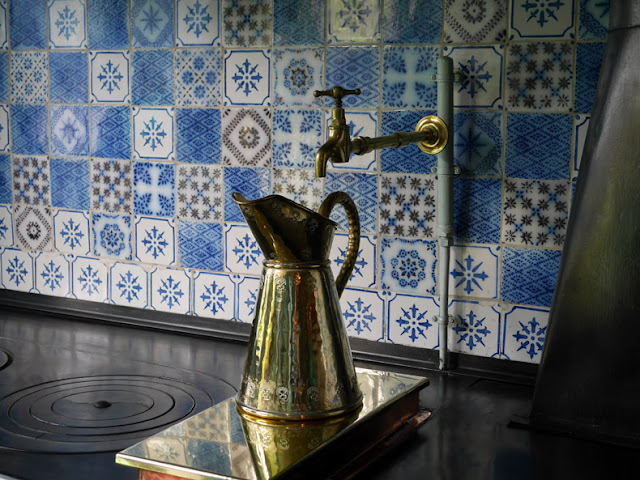 I would love to have some of his beautiful tile work in our house, and I love the pretty curtains and the french doors. 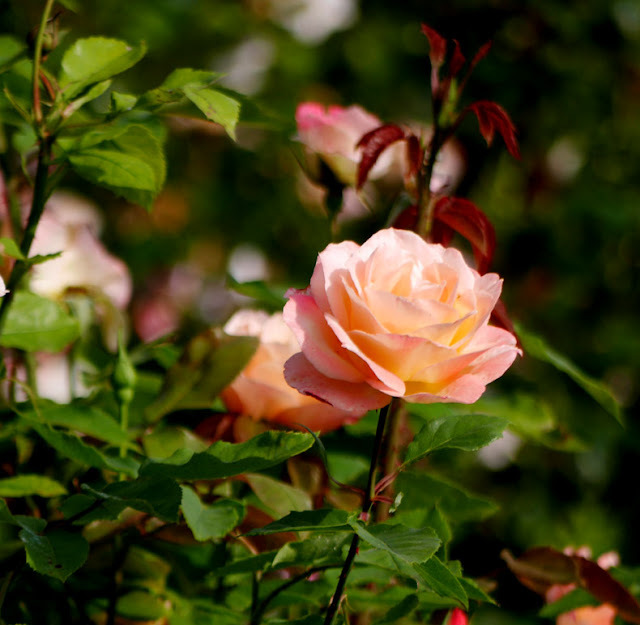 Dearest Lorrie; Woo, What GORGEOUS house tour♪　Enjoyed the really fantastic western style garden and inside(♡^.^♡) The rose picture you chose for closing is so BEAUTIFUL. Thank you SO much for your sweet comment, wishing you wonderful rest of the week. What a great post to read, Lorrie! I checked out the link to how Michel let the gardens go to ruins, but luckily they were restored. My two youngest sons are artists and I will need to show them the inside of Monet's house. Ooh la la, I loved the kitchen! I also read your posts on the windows...you're such a fabulous photographer. What a trip to remember for you and Tim. PS You looked cute in the hat! I don't know if I could get used to that yellow dining room, but oh! the kitchen! So beautiful. Thanks for sharing these photos! What a lovely post! Monet's home and gardens are amazing. I've only visited once, so seeing these images makes me smile with delight. What a wonderful home! That yellow dining room with the other bold accents...red, blue, and green...I want one like it. How neat that it exceeded your expectations. Oh I loved this post, as Monet is a favourite artist of mine. I love that bright yellow dining room. Enjoyed all the photos and bits of info you shared.